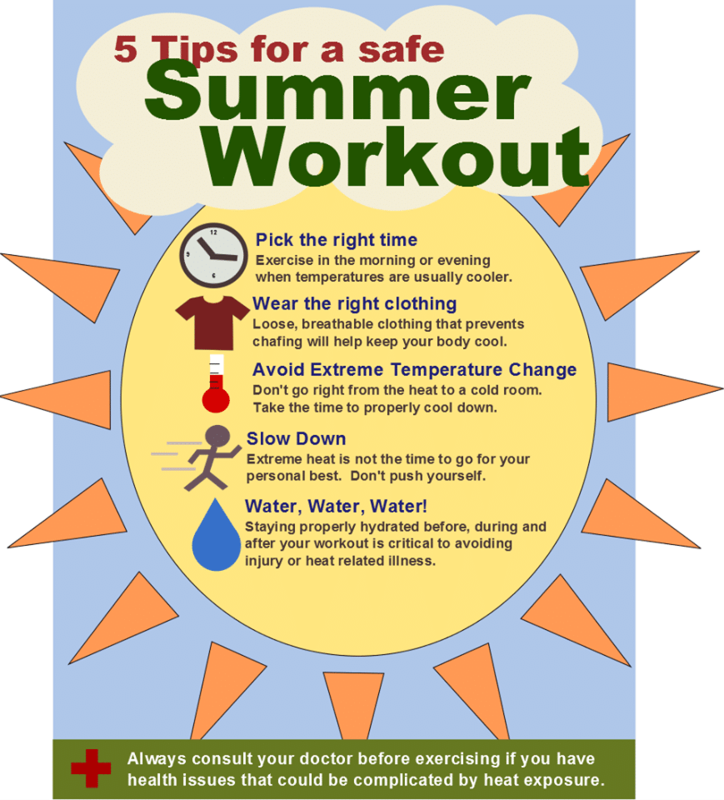 Summer Workout Safety Tips : Summer is a great time to get outdoors for your workout, but it is important to do so safely to prevent heatstroke, sunburn, and other injuries. With a few quick tips, you can ensure that you’re exercising with safety in mind during the hottest time of the year. 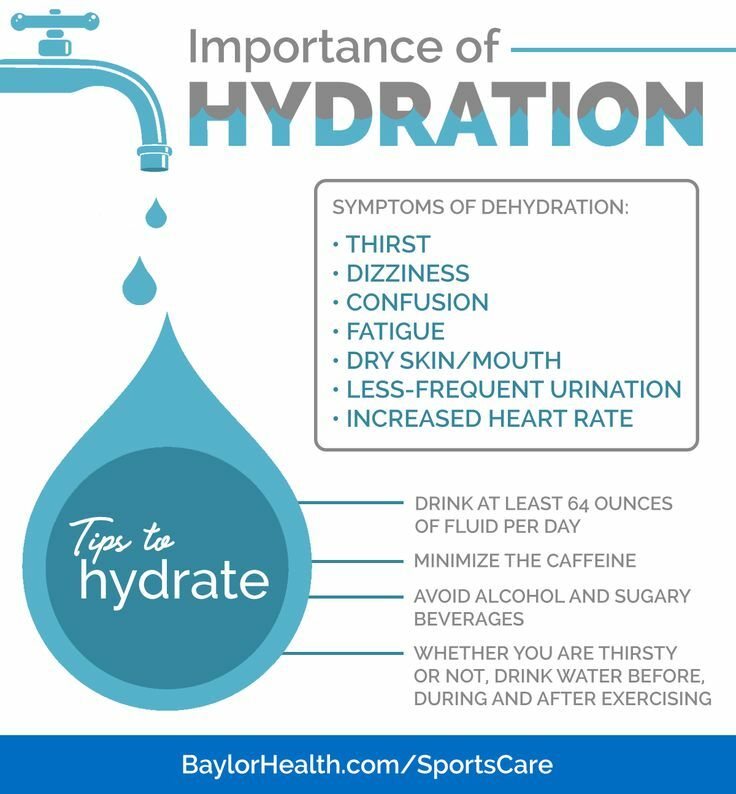 Water is critical to staying cool and hydrated during a summer workout. In the heat, dehydration can overtake the body quickly. It is important to drink water before, during, and after all outdoor workouts in the summer to prevent the body from losing more water than it is taking in. Regardless of whether you feel thirsty, you will need to continue to drink water throughout the workout process. Lastly, water can also help keep you cool during a hot workout. Click here to find out the recommended amount of water you should be drinking. It may be time to make a few changes to your workout wardrobe as the heat intensifies. While running in a jacket makes sense in the cooler months, in the summer, you need to wear clothing that helps keep you cool to prevent heatstroke. Lightweight, light-colored clothing will keep you cooler, and clothing with moisture-wicking properties helps cool your body as you work out. Moisture-wicking clothing helps keep your clothes from clinging to your skin, which can lead to chaffing. In humid conditions, moisture-wicking properties can be the difference between overheating and staying cool. Being outside in the summer comes with more risks than it does in other seasons. Both the sun and bugs pose a threat to the fitness buff in the summer. Protect yourself by using both sunscreen and bug repellant. Sunscreen will keep you from getting a sunburn, and potentially dealing with more serious consequences like skin cancer, while bug spray can prevent you from getting Lyme disease and other serious illnesses from mosquitos. One of the main safety concerns that people who workout outside have year-round is dangerous people. To stay safe, only run in areas that are well-lit and well-traveled. Secluded, remote areas are much more dangerous for runners—especially women. Having other people nearby makes you less likely to be assaulted, kidnapped, or hurt by another person. Remember to stay in well-lit areas and wear appropriate clothing—especially if you are running on the road. In the darkness, it can be hard for drivers to see runners who are wearing dark clothing, so keep your outfit in mind when running in the dark as well. When possible, it is best to bring a friend with you during your runs. There is safety in numbers and going with someone you know and trust can make you feel more comfortable and confident, which is a great way to deter potential threats. Always let someone know that you are going to be gone and tell them where you are planning on going. Set up a post-workout call or text, so that if something happens, somebody will know to alert the police. Just being out in the heat takes a toll on the body, so when you add in exertion, the heat can be very dangerous. Muscle spasms and cramps are your body’s way of telling you to ease up. Heat cramps are easily treated with stretching, light massage, and fluid replenishment, but you will want to avoid exercise for a few hours after you get them. Heat exhaustion causes fatigue, breathlessness, dizziness, vomiting, and fainting. Your skin will probably start to feel cold and clammy or hot and dry. Heat exhaustion can cause low blood pressure and a weak, but rapid, pulse. If you are experiencing heat exhaustion, find a cool area and drink lots of water. The most serious heat-related problem is heatstroke. When your core body temperature reaches 104°F, your body is experiencing heatstroke, which can cause confusion, disorientation, rapid pulse, rapid breathing, and flushed skin. You should seek medical attention immediately if you believe that you are experiencing heatstroke. Exercising safely should be a focal point for all athletes. Following these few tips can prevent illnesses and injuries that could have you sidelined for weeks, even months. Get Healthy with Niki for Summer! Workout-Routine, Tips + Banana Berry Smoothie Recipe!